Owls, classic cars and topiary people helps charity raise £4,000 at 80th anniversary fete. 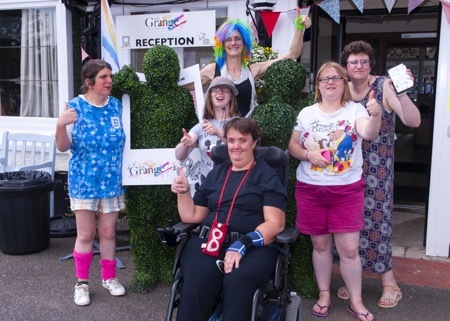 The Grange charity which was founded in 1938 as The School of Stitchery and Lace saw hundreds of friends and supporters turn out to celebrate its 80th anniversary fete on Saturday. Big attractions were the topiary people who were on duty to meet and greet visitors, the classic cars and motorbikes, and Owls To You, a display of four beautiful birds of prey plus stalls music from the Martinau Brass Band. The fete ended with a mass African drumming workshop with over 100 drums provided by ‘Drum With Us’. The 80th anniversary celebrations continue in Heritage Week on 15 September with the opening of the Heritage Room. The Room will feature textiles made for Queen Mary, letters for royal households and vintage photos.